Like Donald Trump, Judge Andrew Hanen—whose preliminary injunction was affirmed by the Supreme Court’s 4-4 decision—is a man with some longstanding, violently hostile opinions about immigration and the Obama administration. In a series of cases dating back to 2010, Judge Hanen has issued impassioned but entirely gratuitous commentaries excoriating the Obama administration’s immigration policies and its policymaking officials at every turn—in each case exhibiting an unusually high degree of personal interest, animosity, and emotional involvement in immigration-related matters far afield from any of the issues that were properly before him as a judge. In a number of these opinions, Judge Hanen has exhibited a somewhat tenuous grasp of reality. For example, at one point Judge Hanen angrily (and wildly) accused the Obama administration’s immigration policymakers of hatching a “criminal conspiracy” with “evil individuals” to violate the immigration laws. It is no secret that the Republican plaintiffs challenging the Obama administration’s immigration initiatives—well aware of Judge Hanen’s outspoken criticisms of the Obama administration—filed their lawsuit in Brownsville, Texas, precisely in order to steer its assignment to him. The claims in the lawsuit were rather weak—so weak, in fact, that in the meantime the plaintiffs largely abandoned the arguments that they originally advanced. Nevertheless, Judge Hanen vindicated the plaintiffs’ forum shopping by enjoining the Obama administration’s initiatives, in a sweeping 123-page ruling littered with provocative assertions about the ills of unauthorized migration. To substantiate the lawsuit’s weak claims, the opinion played fast and loose with the facts—for example, by repeatedly claiming that the initiatives “award legal status” to millions of “illegal aliens” when, in fact, they do no such thing. While the two appellate opinions by Judges Jerry Smith and Jennifer Walker Elrod affirming Judge Hanen’s injunction sought to rearticulate Judge Hanen’s clumsy and bombastic assertions in more refined terms, their analysis reproduced many of the same basic flaws that appear in Judge Hanen’s own decision. Later, in denying the government’s motion for a stay, Judge Hanen doubled down on the false assertions in his original opinion and added the new, wildly untrue assertion that President Obama personally “ordered that the laws requiring removal of illegal immigrants that conflict with the 2014 DHS Directive are not to be enforced, and that anyone who attempts to do so will be punished.” To support this assertion, Judge Hanen pointed to extrajudicial information that he appears to have found on the Internet. 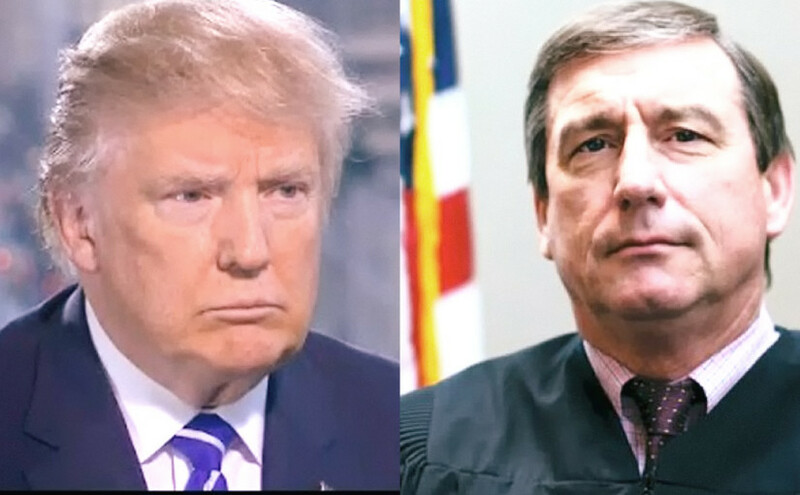 Given Judge Hanen’s obvious hostility towards the Obama administration and its immigration policies—along with an angry and emotionally involved approach to judging in these cases that at times seems to regard facts and truth as optional—it should hardly be surprising that some have characterized him as the Donald Trump of the federal judiciary. Interestingly, just as Trump has found it difficult to “pivot” to a more restrained and less controversial campaign for the general election, Judge Hanen, too, has found it difficult to tone things down and stay out of the headlines—even as the litigation has been pending before the Supreme Court. To remedy the government’s supposed misconduct, Judge Hanen took the freakish step of ordering all DOJ lawyers to undergo ethics reeducation, conducted under his own ultimate superintendence, before being permitted to appear in court in any of the twenty-six states that have sued to challenge the Obama administration’s immigration initiatives. Judge Hanen also supplemented that continuing legal reeducation requirement with what effectively amounts to court-ordered doxing, directing the government to provide detailed personal information on over 108,000 unauthorized immigrants for whom deferred action under DACA was renewed prior to Judge Hanen’s February 2015 injunction—without even pretending to offer a plausible rationale that would justify those steps as appropriate remedies for the Justice Department’s alleged misconduct. In this context, when the Supreme Court granted certiorari to review Judge Hanen’s preliminary injunction in United States v. Texas, it squarely and necessarily presented itself with the choice of whether it would embrace or reject the trumpisprudence and judicial truthiness that formed the basis for Judge Hanen’s decision-making—just as, in the realm of electoral politics, “mainstream” Republican politicians this year have been forced to choose whether to embrace or reject Trump himself as the party’s presidential standard bearer. In the political realm, that latter choice has caused many Republican politicians to squirm as they struggle to explain and justify their decisions. Or if they can get away with it, to try to have things both ways or to avoid explaining their choices at all. 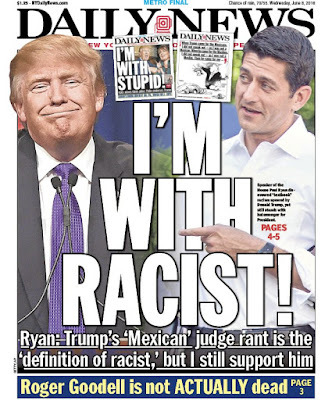 Witness, for example, the cringeworthy spectacle of Paul Ryan criticizing Trump’s attacks on Judge Gonzalo Curiel as “the textbook definition” of racism—before reaffirming his endorsement of Trump due to their “common ground.” And then multiply that by several hundred. Faced with an analogous choice, Chief Justice Roberts and Justices Kennedy, Thomas, and Alito must be understood as having effectively endorsed Judge Hanen’s anti-immigration trumpisprudence and judicial truthiness. But unlike Paul Ryan’s endorsement of Trump, the justices’ endorsement of trumpisprudence will less easily face public scrutiny, for it has come silently and behind the cloak of a one-sentence per curiam opinion. With no judicial opinions giving reasons for their endorsement (and indeed, without even any formal documentation of how they voted) the justices have evaded any responsibility to explain and justify their decision—an obligation ordinarily understood as central to the judicial role. 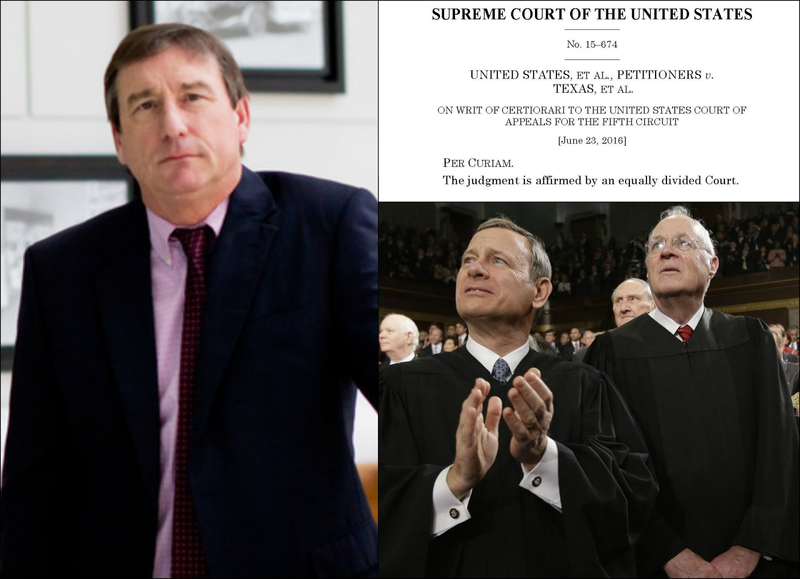 Ironically, some of the politicians squirming in the face of the choice whether to endorse Trump have performed better than the justices did in United States v. Texas in attempting to give reasons to explain and justify their choices—which is only to say that unlike the justices, at least some of them at times have made minimal attempts to do so, even if unpersuasively and unsuccessfully. As noted above, the litigation in this case is by no means over—that is, assuming that Paul Ryan’s man Trump does not win the election and moot the lawsuit altogether by rescinding the Obama administration’s initiatives. But assuming that Trump does not win, the litigation will likely proceed to trial, after which it may return to the Fifth Circuit and eventually the Supreme Court, which might or might not by then (or ever) have a ninth justice. In the meantime, Judge Hanen’s other shenanigans, concerning the sanctions he wants to impose upon the Justice Department, will likely result in a separate trip to the Fifth Circuit and perhaps even the Supreme Court as well. As terrifically illustrated in this post, the judge shopping alone should have caused the Court to rule against the District court. That there were four justices who declined to do so is just another illustration in the long history of the Court conservatives putting politics above the law. Judge shopping is a thing that various sides do and have done for years, so that sort of thing might not only affect "conservatives." A lawyer on another blog noted a major problem with a tie is that in effect a single circuit given the special details of the case turn out to set national (here international) policy. This to him (and me) was particularly problematic. And, it was avoidable -- back to the days of John Marshall, the Court avoided deciding major cases because personnel issues might evenly divided or something. At the very least, I think they should have held it for re-argument, staying the lower court for the time being. 4-4 -- and problems with the rulings below noted here and in a past post just aggravate things -- is a shameful failure of Supreme Court duty. Roberts had some moments where he shined (see more than one PPACA case, though the first one was not a full clap for me). This was a low point. The Southern District of Texas seems to have been designed to facilitate judge shopping, with the vast majority of judges in Houston, but tiny numbers in the other six divisions. He has truly arrived now. As terrifically elaborate in this post..